I have blogged before about how I have overlooked certain facts when reviewing resources I find for my ancestors. I get very excited to have these resources and don't always review them as well as I should. This is especially true when it comes to documents that I receive in the mail. I have sent off for many documents through snail mail, which I love, because the anticipation is great! But what often happens when the documents finally do arrive is that I get a temporary high by reading through them quickly and then set them aside. I might be studious enough to file the documents, but I typically do not turn back to them. I learned today that this practice isn't always very wise. I decided to take a look back at an ancestor I have spent quite a bit of time on: Joseph M. Creed. 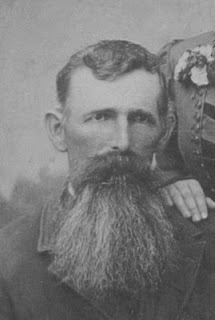 Joseph is my 2nd great-grandfather and was born in 1841 in North Carolina. Joseph seems to be a rolling stone as I find him all over the country. He starts in North Carolina, enlists in the Army during the Civil War in Missouri, farms in Kansas, requests his Army pension in Texas and dies in Oklahoma. He is also an ancestor that I have received quite a bit of information about from fellow Creed family researchers. I received a history of Joseph Creed and his family from one such researcher. The history is written by Joseph's granddaughter, Flossie Whitlock Emmons. The entire history is intriguing, but one interesting thing that caught my eye was her mention that Joseph had participated in the Oklahoma land rush. It states that he participated in the first land rush on April 22, 1889, but that the family had such a hard time making a go of it that they gave up the land. It also mentioned that Joseph ran in the fourth land rush on September 16, 1893. The second run opened a strip of land which included present day Pawnee County, Oklahoma, where I knew that Joseph lived and was buried. Was it possible that he received the land through the land rush of 1893? Through my research I learned that the Federal government kept a listing of all homestead applications in Oklahoma territory in a series of books called the Federal Tract Books. A microfilmed version of the books is owned by the Southwest Oklahoma Genealogical Society (SWOGS) and the organization has made an index of all the homesteaders. For a $5 donation the Society will conduct a search on your ancestor. I received a quick response from the SWOGS and Joseph Creed did indeed receive 160 acres of land in 1893. I got a jolt of joy over the information, then quickly filed it and forgot about it. That is until today. I once again decided to look in on Joseph Creed to see if I could find more information on him. To remind myself of what I had already accomplished I flipped through the Creed section in my family history binders. I came across a piece of paper titled "Federal Tract Books of Oklahoma Territory." It must have come with my response from the SWOGS, but I had never read it...or at least not the back of it. It describes, in detail, that once you receive information regarding your ancestor's tract from the Federal Tract Book, you can then order a Case file of that individual from the federal government. The case file could include land surveys, a Homestead application, testimony regarding citizenship and birth date, among other things. There could be some very interesting information in it and I couldn't even bother to turn the page over. Well, today I did. I also went to the National Archives website and ordered a copy of Joseph Creed's land patent case file using NATF Form 84. I used the eServices portion of the site and was able to order the documents online. In order to use the online system you must know the individual's first and last name, the state their land was located in, an approximate date of entry, and the section, township and range number for the land. In my case, this information was provided in the packet I received from the Southwest Oklahoma Genealogical Society. The charge for research and shipping of the documents from the National Archives is $40 for this particular type of document. The fees are not charged if the archivist cannot find any documents related to your search. I am very excited to see what may come from this request and I have been reminded of how important it is to read through documents thoroughly before filing. Thank you! You gave me a few more resources & a possibility to a story yet to surface. Thank you! So glad to hear it may be helpful. Please let me know if you are able to find out anything more!